Three voluptuous vases in different styles and sizes all attest to the ceramic tradition of Sawankhalok in Sukhothai Province. 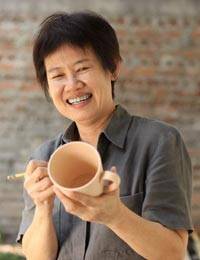 Duangkamol is a master of Thailand's celadon ceramic technique, demonstrating her skill with this elegant trio. Their surfaces reveal the subtly crackled appearance of true celadon.